It's Friday . . .er, it is Friday, right? With Independence Day on Wednesday this year, it's felt like we've had two sets of weekends in one week. I wandered around yesterday swearing it was Monday and then found out around 2:00 pm that it was, in fact, Thursday. It was the Monday-est Thursday ever. We celebrated another wedding last weekend - and of course had some wedding selfie adventures, too. Here's a few of our favorites - congratulations to Haley and TJ! We loved celebrating with you. At a 4th of July party this week, an engaged friend told us that there are plenty of great places to take awkward selfies at their upcoming reception. Our trend is catching on! In unfortunate news for my wallet (and my waistline), Dunkin Donuts has brought back their summer happy hour in the Kansas City area. From 2pm - 6pm every day of the week, their medium iced coffees are just $0.99. I may or may not have gone to Dunkin Donuts twice in one day this week. Okay, who are we kidding. I definitely went there twice in one day this week. But I went once in the morning and then again in the late afternoon, so it was a different crew. I'm pretty sure that the staff at my go-to Dunkin location will know me on a first name basis by the time August rolls around. 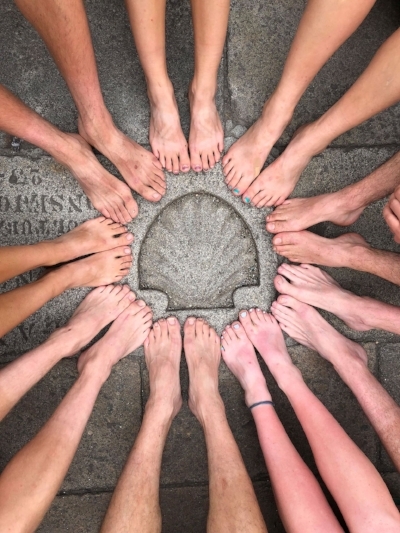 My little sister Mady left for Spain at the beginning of last month to walk the Camino. After a beautiful pilgrimage, she finally returned home yesterday. Since our house is a great resting spot on the way back to my parents from the airport, we got to snag her for dinner and a Camino debriefing before she headed back home. Her gorgeous pictures (like the one above!) and stories made me want to add the Camino on to my ever growing list of places I'd love to travel. Now if I can just swing trips to Italy, the Holy Land and the Camino, we'll be set! I only have a few more hours left in the day to sing Taylor Swift's "22" - I turn 23 tomorrow! Joseph has something planned for tomorrow night. All he's told me is that it involves creme brulee, avocados, and goat cheese - which is all I need to know. A happy early birthday to my little sister, Reagan, too! We're born on the same day, four years apart. She'll be out camping all weekend and it's one of the first years we haven't fought over who gets to pick the ice-cream and who gets to pick the cake. Happy birthday, Regs! We joined some friends for a double date night at our local board game bar last weekend. Unfortunately, it was also Harry Potter Trivia Night, so we had to wait around quite a while before a table opened up. We grabbed some drinks at the bar and settled in. It didn't take too long for a guy at the end of the bar to look Joseph and I's way, make eye contact, and shout "HEY! Are you two siblings!?" We let him know that we weren't (well, brother and sister in Christ, but that's a whole different conversation). Maybe it was the butter beer talking. By the time Joseph and I are thirty, we're going to be mistaken for identical twins. Joseph and I always talk about how we'd love to have our "hangout" - a normal place around Kansas City for dinner, a favorite bar, or a place that people would know where we spend time. It turns out our hangout spot is the optometrist. Joseph went back to the optometrist office to get the lens of one of his glasses adjusted (it's only the fourth or fifth time we've been in there over the past month). It turns out they have to make the lens for the third time, so we'll be back there next week, too. I mean, Dunkin Donuts and the optometrist office aren't the worst places to be known on a first name basis, right? 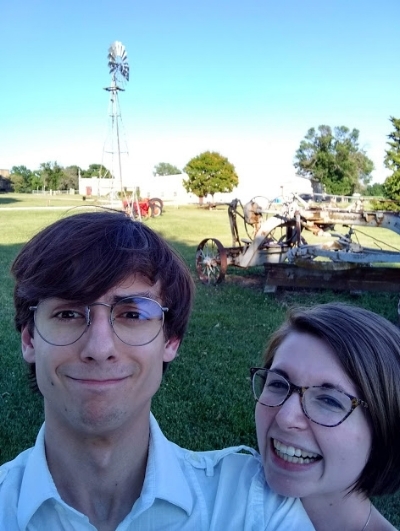 In-between a friend's wedding and reception, Joseph and I headed to a local farm store to get some food for Wilson (these are normal things married couples do, right?). We wandered around the aisles, reading the nutritional facts on the back of the packages and ended up getting a 25 pound bag of food. Crossing our fingers and hoping it would pass the Wilson gourmet test, we fed him some that night and . . . he loved it. I'm glad to report that he's back to his normal eating habits!